Ever since Jennifer Knapp exploded onto the music scene with KANSAS, she's been a fan favourite. Now it's time for her first Greatest Hits CD. Hits like "Undo Me", "Into You" and "By and By" will be accompanied by previously unreleased material showcasing Knapp's songwriting and musical abilities. It's a piece every Jennifer Knapp fan will need to have. 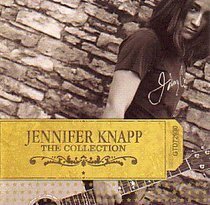 About "Jennifer Knapp Collection (Single Disc)"
Knapp is a popular Christian folk and pop recording artist.